Rally is a fast racing game where players try to become the first to reach the end of the Rally bar and win the race! Players compete between towns all over the country where they hand in their destination cards in order to score Race and Rally points. Along the way players sometimes need to draw Rally cards. Some are lucky and get extra points or money, while others lose some instead. Speed and excitement from start to finish! Who will be the first? 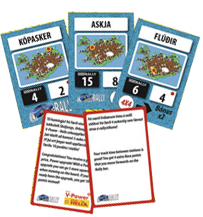 Rules and cards in the game are both in Icelandic and English! 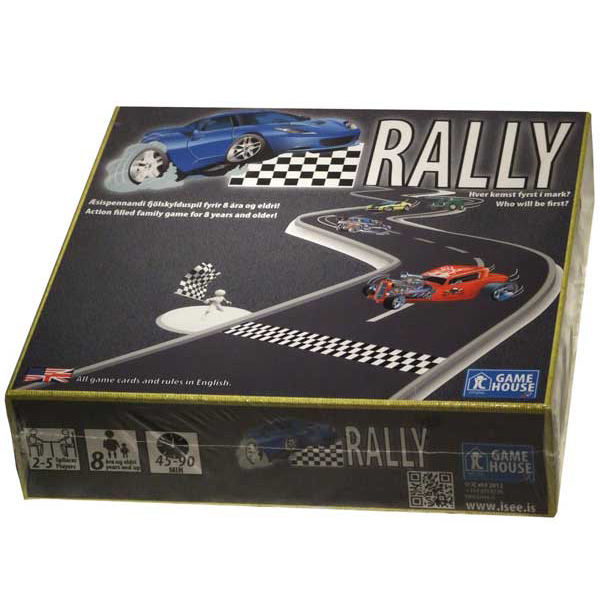 Rally is a fast moving race game where each player has its unique race car. Each car is different, giving players different movement or bonus points during the game. At the beginning of the game, each player receive 3 location cards. The aim is to get to the locations shown and when reached, players hand in the location cards to gain Race points & Rally money as shown. As players collect more Rally money they can buy upgrades that enable them to gain more points, move faster or gain access to the highlands. Gaining access to the highlands give players shortcuts between locations in the Island. The game ends right away when any one player reaches the finish line. The game board shows the Rally bar, where players score their Rally points when they hand in their Location cards. The map of Iceland shows you actual locations of most populated towns and a few highland locations. Randomly on the “road” there are Race card tokens and if players end their movement there, they have to draw Race cards. Some are good others not so good. On the board there are also slots for the buildings upgrades, showing the cost of them as well. 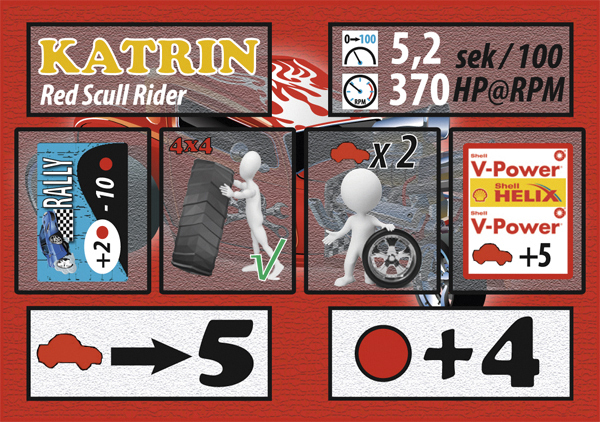 Locations and Race cards are placed in their card slots on the board. Race Cars: Each Player has an unique race car that gives them different movement and points. Players move their Wooden cards on the board according to the movement number shown. When handing in location cards (the shown destination reached) players receive additional Rally money as shown on their tile (red dot). Location Cards: The Location Cards show you where you need to go. When the destination is reached, players hand in the card and receive Race points (black dot) and Rally money (red dot) accordingly. 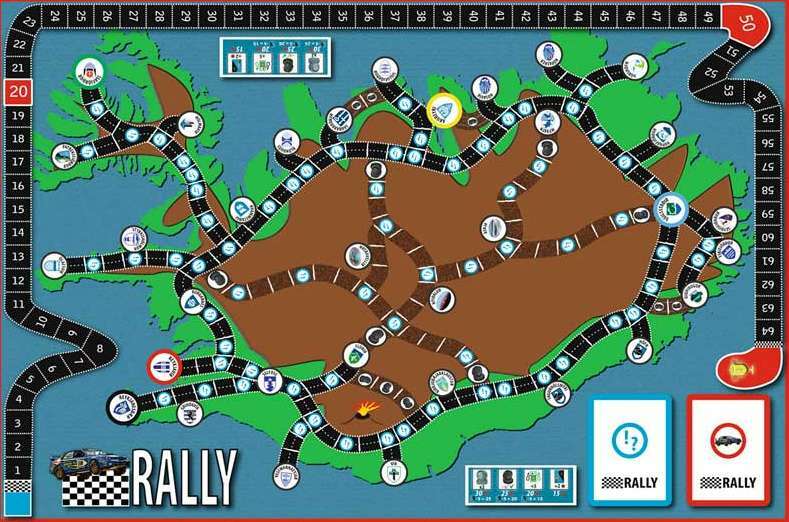 If the destination was reached through specific means, as shown on the Location card, players receive bonus Rally money. 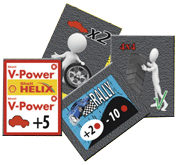 Rally Cards: The Rally cards are drawn when a player ends their movement on the Rally card slot on the road. The cards can either aid you or punish you. Good vs. bad ratio; 70 / 30. Upgrades: When players have enough money, they can buy an upgrade for their cars. The cost for each is shown on the game board. Upgrades unable players to move faster or earn more Rally points or money.